A sport-utility vehicle packed with artillery shells blew up Thursday in a crowd of people waiting to volunteer for the Iraqi military, killing at least 41 and wounding 138. Another car bomb north of the capital killed six members of the Iraqi security forces. The explosion in Baghdad, the deadliest attack since a bombing outside another recruiting center in February, was part of a surge of attacks on U.S. coalition forces and their Iraqi allies ahead of the transfer of sovereignty to Iraqis on June 30. The blast scattered bodies and debris across a four-lane highway outside Baghdad's Muthanna airport, which is used as a base by both the Iraqi Civil Defense Corps and the U.S. military. The explosion could be heard for several miles and sent a cloud of smoke over the city. No American or Iraqi troops were injured, U.S. Army Col. Mike Murray said. Most of the victims appeared to be poor Iraqis hoping to join the security forces because job opportunities here are limited. Another car bomb exploded Thursday afternoon in a village near Balad, 50 miles north of Baghdad, killing six members of the Iraqi Civil Defense Corps and wounding four others, the U.S. 1st Infantry Division said. There were no further details. A rocket slammed into a U.S. logistics base near the city of Balad Wednesday, killing three U.S. soldiers and wounding 25 people including a pair of civilians. 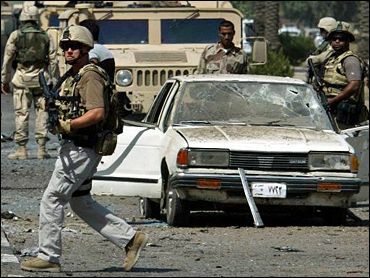 An Iraqi police officer was killed and five Iraqi civilians were wounded Wednesday when a roadside bomb exploded near a U.S. convoy in Ramadi. Bluntly contradicting the Bush administration, the commission investigating the Sept. 11 attacks reported Wednesday there was "no credible evidence" that Saddam Hussein helped al Qaeda target the United States. President Bush said Tuesday the United States will turn over former Iraqi leader Saddam to the new government in Baghdad at a later time, contradicting the interim prime minister's claim that the handover was imminent. Hospitals throughout Baghdad were flooded with wounded, said Saad al-Amili, a Health Ministry official said. "The figures we have are not final," he said. "We highly expect that the number of injured and dead will increase." A large plume of smoke rose over the city after the blast, which could be heard several miles away. Capt. Hani Hussein of the Iraqi Civil Defense Corps said about 100 volunteers were trying to enter the recruiting center when a car crashed into the crowd. "We were standing waiting for our turn to register," Rafid Mudhar told The Associated Press from his hospital bed in Karama Hospital. "All of a sudden, we heard big explosion and most of those standing fell on the ground including me." He said he was unconscious for a while, then managed to reach a nearby ambulance. Yas Khudair, a member of the Iraqi Civil Defense Corps, said all the victims were "poor people" who "wanted to volunteer to support their families." "There were no Americans nearby when the explosion took place," he said. Murray said many of the victims had just gotten off a bus which "happened to be near the area when the blast happened" about 9 a.m. along a four-lane road near the old Muthanna airport, which is used by U.S. forces as a base. "This clearly again was an attack that has hurt the Iraqi people," Murray said. Iraqi security forces tried to help the injured as blood-soaked victims were loaded into ambulances and cars. U.S. troops milled around the scene. Glass and debris littered the four-lane highway. Bloody bodies covered in dust were scattered around the blast site. Residents and Iraqi security forces carried corpses away from the area, some on stretchers, some by hand. They loaded some of them onto trucks. One dead man lay prostrate in the center of a highway median. The blast smashed windows of several cars in the area and hurled at least one into the center of the highway. At least one artillery shell could be seen lying on the road. Insurgents in Iraq often fashion bombs out of artillery shells and other military ordnance. The ICDC is Iraq's main internal security force, created by the U.S. administrators to battle the country's insurgency.